On June 28th, 2009 a Mr. Timothy Cox, 42, saw a tall, hairy creature walking through a pine thicket. " 'I was blackberry picking in an old Wesvaco area," Cox said. " I was picking the berries near a set of three year old pines that stood about 10 feet tall at the time. Some deer come running out of the pines about 50 to 70 yards from me to the side. They were running pretty fast. I thought that it was strange that they did not even notice me but were scared to death of something. I heard something else coming through the trees just a few feet into the trees... near where the deer came through. I could see a dark brown colored thing that was moving the branches apart as it was walking between the rows of pines. This thing was moving at a fairly brisk pace and the branches were popping as it went along. I said 'what the hell is that?' It was tall nearly 8 foot tall or more because it was moving branches 3/4 the way up these trees. I could see an arm and part of its body. It continued down the row of trees. As it got further away I decided to get the hell out of there and run back to my truck 1/4 of a mile away. It scared the hell out of me." I interviewed Mr. Cox on April 6th, 2010 and he was a straight-forward, no nonsense type of fellow. The creature was walking fast through the trees, grunting as if was annoyed but unaware of the witness' presence until after he ran from the scene. The wind was blowing toward Cox but he noticed no unusual smells in association with the encounter. Seeing the huge beast scared him thoroughly, he admitted, and he made no pretense of bravery during the episode. He did what most would - he ran away. He was, after all, completely unarmed save for a small hunting knife. He described the creature as upright, about 8 foot-tall with long arms which it used to push branches and limbs away. It had a stocky build and was entirely covered with long brown hair, he recalled. "It just scared the hell out of me," he repeated. He estimated the humanoid’s weight as 500 to 600 pounds. According to him both he and his son were surprised while turkey hunting in the area the previous spring when another herd of deer came running frantically out of the forest. One of them was a small doe, he told me, and it was so scared that it actually ran into a tree nearly knocking it unconscious. Then a terribly wailing roar erupted from the woods, followed by sounds of something very large walking quickly through. Like the deer, the turkey hunters fled the area. The incident scared his son so badly that he wasn't interested in turkey-hunting at all now. Cox admitted that the sound scared them both. He'd never heard anything like it before. Later, as he was researching the subject he came across the alleged Bigfoot recordings from Ohio and stated that they were a dead ringer for the sounds they had heard. On both occasions he had heard the sound of trees and limbs cracking and snapping loudly suggesting that the creature was making no attempt whatever at being stealthy. Interestingly, Mr. Cox was first exposed to the phenomenon during a family outing in 1973 when he was just six years old. His grandparents, an uncle and he were walking along a nature trail on Pineville Mountain over in Bell County when his grandfather spotted a figure a couple hundred yards up the mountain and pointed it out to everyone. It was humanoid, covered in dark hair and was standing behind a small tree staring right at them. At first the uncle thought it was a bear, but there was no muzzle and it stood upright with one arm around the tree just like a man would. Alarmed, the group then beat a hasty retreat down the mountain. Despite having been in these entity's presence on three separate occasions and reacting in fear each time (just like the animals), Cox feels that the Bigfoot creatures are most likely a form of some unknown, hairy human. Report: Upon arrival, we established a baseline. We walked around for about 30 mins and heard absolutely nothing, not a single animal or noise. It was sunny and about 40 degrees with no wind. We made our first tree knock, from on a ridge, at approximately 12:50pm. We then proceeded to hear multiple return knocks (at least 4 loud and 2 small knocks) from each side of this bottomland, each getting closer and closer to our location. This interaction went on between us and "them" for about 20 mins. During this transaction we witnessed a large black coyote, which was hiding in a thicket at the tree line, jump up and run deep into the woods. Because only one of us only caught a glimpse of the "coyote", we decided to go down to it's location and verify it's tracks. It was in fact a coyote. While at this location we heard a low moan/growl a few hundred yards from our location, where we had just crossed the creek. As we walked closer to where we heard the growl, one of us caught a brief smell of something fowl. At this new location we surveyed the area and then did another tree knock. No response was received. While driving away from this location we noticed a deer on the dirt road coming up from the very location where we just had all this activity. The deer was seen approximately at 1:45pm and had obviously been moved off its bed. This was a prime location, a bottom surrounded by thick trees on all boarders and a wide creek on two sides --an ideal place for a group of bigfeet and coyotes to observe deer from any side and coordinate an attack. There has been a history of reports in this area. We think, due to the coyote and deer, tree knocks, growl and smell, that had we stumbled into a hunt in progress. Follow-up: Received a call from 2 witnesses on 1-15-09. While hunting in a similar area, only about a mile away from the report above, a large 6-7 ft black, upright creature was viewed in a tall grassy field. The witness's had been call blasting a distressed rabbit call from their truck up on a hill. When finished, around 8:00pm, they drove down the hill and around a corner. It was at this time the truck lights caught this creature standing in a meadow approximately 200 yards away. It turned it's head, took 5 or 6 steps, then slowly began crouching down as it made it's way to the tree line. We were fortunate to interview the witnesses 2 days later on camera. We did not tell them we were going to interview them on camera until we arrived at the location. We interviewed both witnesses simultaneously and separately, using two camcorders. Both of their accounts were strikingly similar and without embellishment. We found these witnesses to be truly credible and are very thankful for sharing their story. Neither witness received any method of compensation for their time. After searching the area we were able to find to two footprints and attempted to cast them. 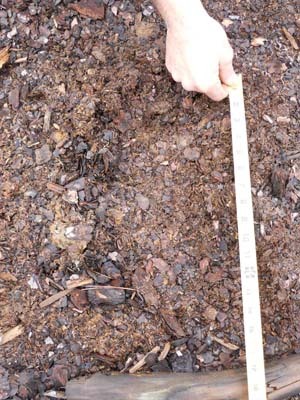 Unfortunately a heavy rain hit the area the night before and the area we found these prints was directly across the street in a small clearing which was made up mostly of wood chips. Weighing 250 lbs myself, I tried to make an impression next to one of the prints and my print was only half as deep as the print we found. Photos of the prints / casts will be posted here soon. The reason we could not find prints where the creature was spotted was do to the tall grass which was "full" of game trails crisscrossing in every direction! The grass was matted down in every direction due to the heavy amount of game trails. We could not even see our own tracks, or paths due to these conditions. Also noted: deer and coyote feces throughout these trails. 2-10-10 UPDATE: Contacted the one and only Dr. Jeff Meldrum and he wants us to sent him the cast, including the many hairs we found embedded in it, for analysis.The Results: the hairs were from deer and muskrat. Roll your mouse over each image. This is not the actual cast, just an overlay to show you the size. 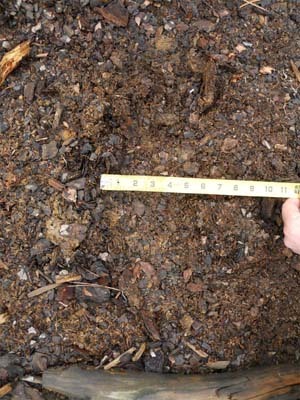 The wood chips and these pictures don't do it justice. Again, when I stepped next to the print, weighing 250lbs, my print was not even half as deep as this print. According to the statistical analysis from this article, we are dealing with an 18 year old, 658lb male. It was traveling around 16mph (according to step length --not shown here). 7ft., hairy, bipedal, red-eyed BF reportedly seen by residents of Blackburn Church Rd on several different occasions.